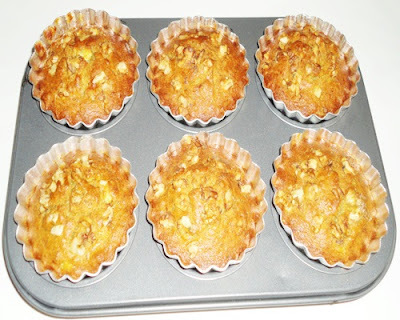 Eggles walnut banana muffin is a delicious, easy to make variety of muffin. 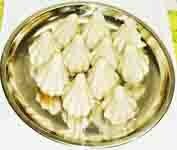 It is full of flavors and is prepared without using eggs. These muffins are liked by both adult and kids. This can be served as a tea time snack and even packed in the snack box for school going kids. 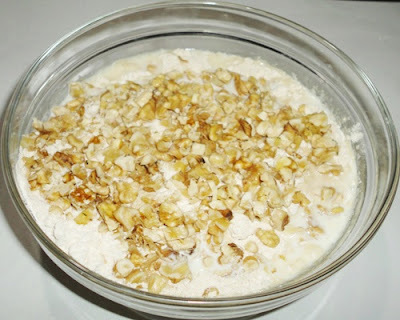 You can make it rich by adding dry fruits like cashew nuts and almonds. 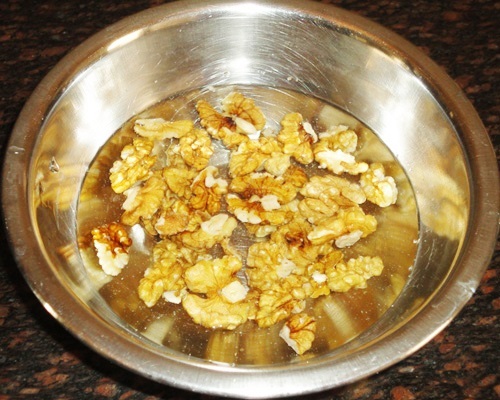 Walnuts become soft and tastes great when it is soaked. Also check out some other eggless cake recipes which I have posted earlier. 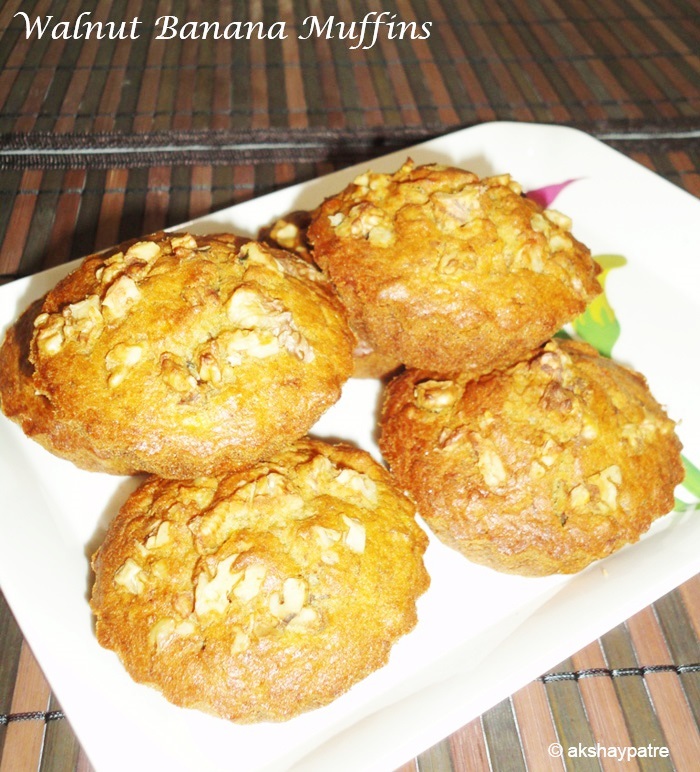 Do try this delicious muffins. 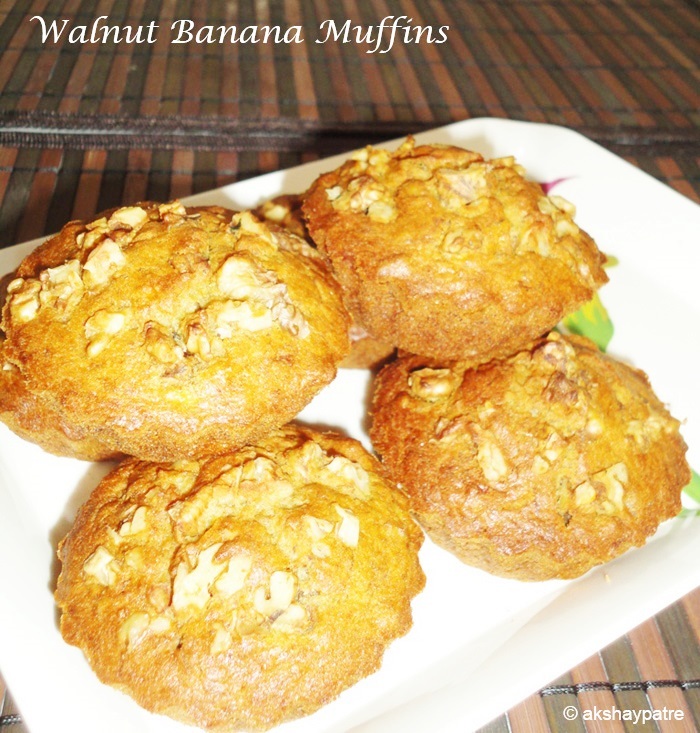 Here is how to make walnut banana muffins recipe with step by step pictures. 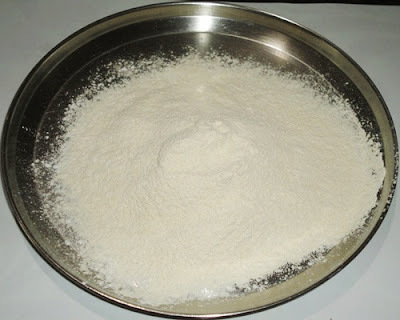 Combine together the wheat flour, baking soda, baking powder and corn flour. Sieve them twice. Set aside. Peel and mash the banana well. Keep it aside. 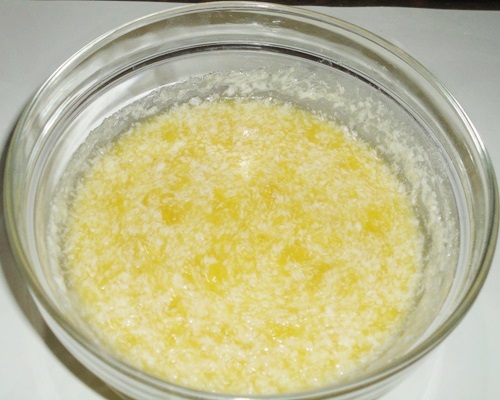 Put the butter in a bowl and whip till the butter become light and smooth. Add the sugar, mashed banana and lemon juice. Mix well till they combine well. Add the wheat flour mixture to the above prepared banana-butter mixture. Add milk. Reserve 1/4 cup of chopped walnuts and add the remaining walnut pieces. Cut and fold the muffin mixture till all the ingredients combine well. Grease the muffin tray and pour the mixture till 3/4 part of the muffin moulds. 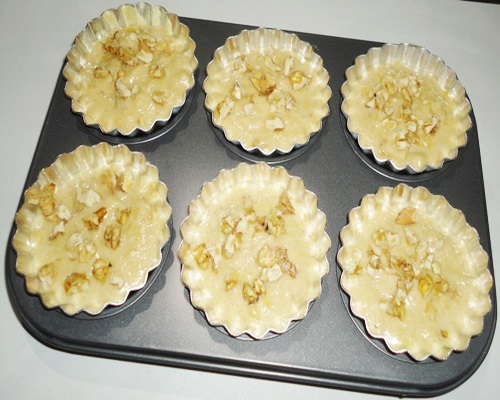 Garnish with the walnuts and bake in the oven at 180 degree Celsius for 25 minutes. Rest in the oven for 5 minutes. Then remove the walnut banana muffins and serve. 1. Wash and soak the walnuts for 3 - 4 hours. 2. 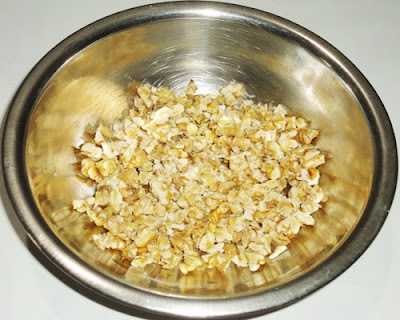 Drain water and chop the walnuts into small pieces. 3. 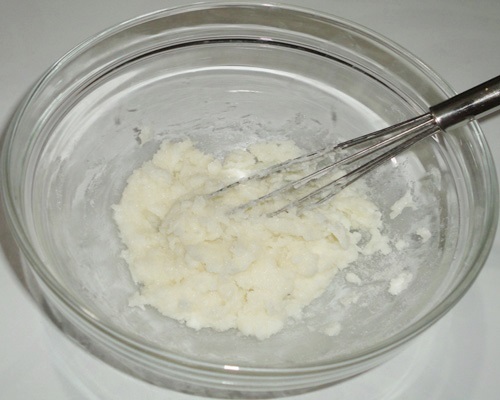 Put the butter in a bowl and whip till the butter become light and smooth. 4. 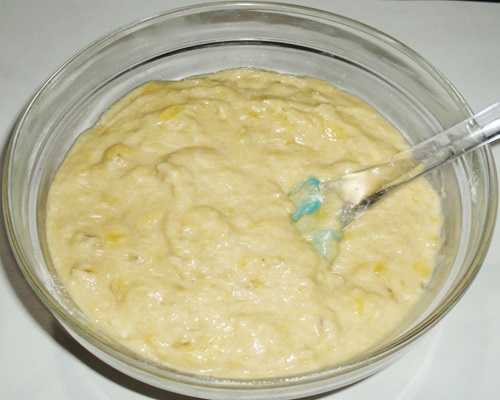 Add the sugar powder, mashed banana and lemon juice. 5. Mix well till all the ingredients combine well. 6. 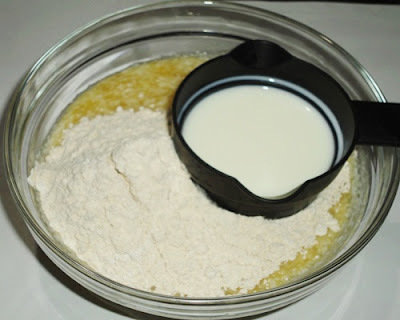 Combine together the wheat flour, baking soda, baking powder and corn flour. Sieve them twice. 7. Add the sieved flour to the banana and butter mixture. Add the milk. 8. Reserve 1/4 cup of chopped walnuts. Add the remaining walnut pieces. 9. Cut and fold the mixture till all the ingredients combine well. 10. 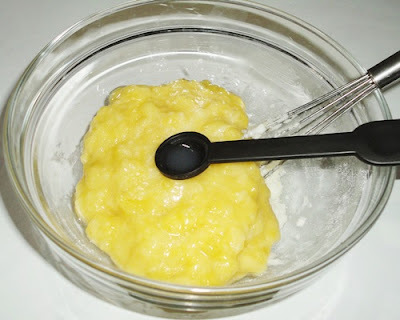 Grease the muffin moulds and pour the mixture upto 3/4 part of the mould as shown below. Garnish with chopped walnuts. 11. In the meantime, preheat oven at 180 degree Celsius for 10 minutes. Bake in the oven at 180 degree Celsius for 25 minutes. Further, rest in the oven for 5 minutes. 12. Separate the walnut banana muffins and serve. It sounds interesting. I don't have walnuts. I am in a hurry to try this. nice and healthy walnut banana muffins...let me grab one of those ..